If you have been a Steam user for a number of years you have probably lost track of how much you have spent on the games platform. You can look through your games library to get a pretty good idea of what you might have spent, it will help your memory become clearer, but it could also be a laborious process, depending on the size of your library and the age of some of the titles. Now Valve has created a tool to help you see what you have spent directly on Steam. The new tool is called 'External Funds Used' and you can find it at this URL. If not already, you will have to log into your Steam account in your default browser. Then you will see something like in the screenshot above. However, my surprisingly low spend in the screencap is due to me very rarely buying direct from Steam. I have tens of games from Humble Bundles and sites such as Green Man Gaming and GamesPlanet that don't show up here. 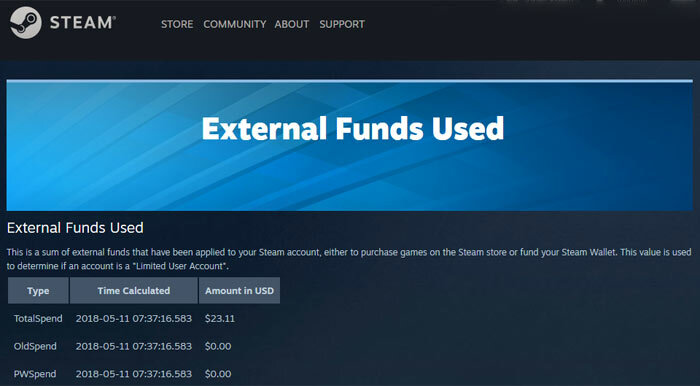 Thus the 'External Funds Used' tool isn't very relevant to my Steam games ownership (a modest 79 games in total). For some better examples than my personal Steam spending you can head on over to places like Reddit where you will find various folk who have spent as much as $13,000, as recorded by this tool. VentureBeat's report on this news includes a more modest spend of $858.25 by their reporter Jeff Grubb. For the record, your 'OldSpend' is money spent on Steam before 17th April 2015. That is the date upon which Steam implemented a new 'Limited User Account' policy to protect against phishing and spamming activity. If HEXUS readers want to share their 'External Funds Used' totals in the comments below it would be of interest to me, and perhaps to others too. If HEXUS readers want to share their ‘External Funds Used’ totals in the comments below it would be of interest to me, and perhaps to others too. Have you signed a GDPR thingy? I'll have to check when I get home. I imagine the total will be surprisingly low, as I buy games cheap and more often they've been gifted to me. Anyway, I thought you could just look through your account transaction history and total up all the spends? Somewhat higher than I imagined, considering most of my Steam games come from Humble Bundle in recent years. Gone are the days I happily pay full price for games, more so now publishers think I'm a console gamer.